Summer Enrollment is Now Open! Click here to read more about our programs. Be sure to create your new account when you begin registration, as we have a NEW registration system! This session is for the entire family. Click here for more information! Registration for Spring Family Camp will open on February 4th!! Be sure to create your new account when you begin registration, as we have a NEW registration system! Please join us Camp Kudzu's first Young Adult event! 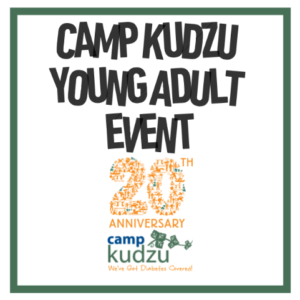 This is an OPEN INVITATION to all our existing Camp Kudzu friends (21 and older) – as well as new potential volunteers too - The more the merrier! Light eats & 2 drink tickets per guest! RSVP TODAY! Family Night with the Atlanta Gladiators! 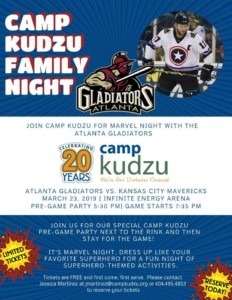 Join us for Camp Kudzu's Family Night with the Atlanta Gladiators as they play the Kansas City Mavericks! We will have a special Camp Kudzu Pre-Game Party next to the rink and then stay for the game! It's Marvel night, so dress up as your favorite superhero for a fun night of superhero-themed activities. Please contact Jessica Martinez at jmartinez@campkudzu.org to reserve your tickets.